Astigmatism is a condition that causes blurred vision due to the irregular shape of the cornea or the lens inside the eye. The cornea and lens are primarily responsible for properly focusing light entering your eyes allowing you to see things clearly. 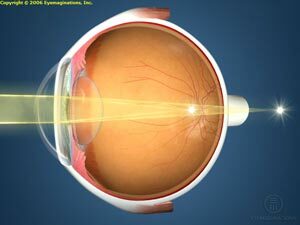 Sometimes astigmatism may develop following an eye injury or eye surgery. A comprehensive eye examination will include testing for astigmatism. Depending on the astigmatism, your eye doctor can provide eyeglasses or contact lenses that correct the astigmatism by altering the way light enters your eyes.